Version 0.21.0 of Cake has been released. 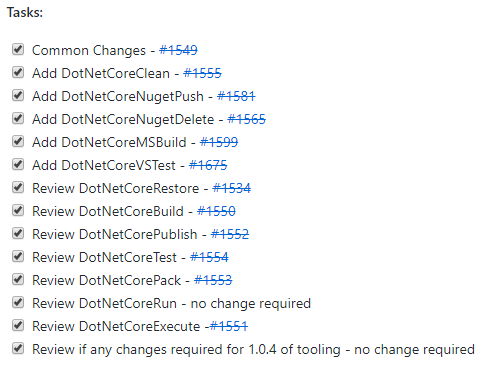 This release is mostly about bringing the .NET Core aliases up-to-date with .NET Core SDK 1.0.4, which is the latest RTM/stable version. The shift to using MSBuild and from project.json to csproj project system has resulted in many breaking changes and additions to the .NET CLI. Regardless of intentional or unintentional breaking changes, the possibility of new releases breaking something is why we always recommend you pin the version of Cake you're running, thus avoiding any unplanned broken builds. You can read more about pinning Cake version here. Huge thanks to Jonathan Kuleff, who has done a brilliant job and epic effort in methodically going through the .NET CLI and Cake aliases identifying what's been changed, removed or added! It's been great working with you through these pull-requests.